The company Name. 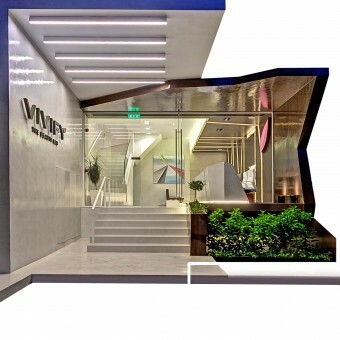 Vivify and Lab, counteracting Human nature with scientific reason . Creating a contemporary space that customizes therapies based on advanced technology while offering classic treatments using herbal recipes. The resulting proposal was to create a dynamic space that emits the austerity of scientific labs while adding familiar connotations of warm classic interiors. 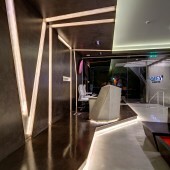 The inspiration for the ground reception area came from zen philosophy and the dyadic nature of cosmos. Demonstrating two opposite halves, it combines white lava plaster with chocolate brown from the classic color palette - clinical white and scientific reason versus tasteful connotations of human desires. The upper level allocated for the technologically supported treatments, had to feel as spacious and private as possible. The design borrows the warmth of classic wood paneling in chocolate brown and a delicious color palette in biscuit brown, pastry white and Chantilly. Metallic accents in gold and copper enhance the luxurious ambience while linear lighting in hallways assists way finding with reference to medical labs. The basement accommodates the sauna, steam rooms and changing lockers. It also offers a quick access to a central spot for nail and limb treatments, while the journey is completed with the private rooms lit with fiber optics and the natural toned ambience of traditional spa interiors. Commissioned in May 2013 in Athens and delivered mid September 2013. Linear design interchanged with Polylines is accentuated by LED strips, breaking solid geometry and bringing innovation and originality to the foreground. A total area of 550square meters, extending over three floors. 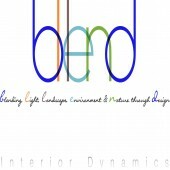 Interior, commercial, corporate, branding, spa & wellness. Research was conducted in wellness and spa facilities across the world. Moreover, research findings on customer/end-user perceptions of wellness ambience, rejuvenation, luxury and spa were utilised in order to be able to provide a tailor-made brand identity that is groundbreaking without losing the ambience of a wellness and spa facility. The fact that the space extends over three floors of 550sqmeters, offered the challenge to create a groundbreaking design for a reception that attracts attention. 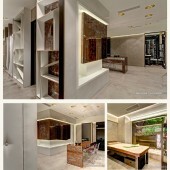 The basement offers the ambience of traditional wellness facilities, without losing its minimal concept. There was also the need for the upper floor, which is occupied by many private rooms, traffic corridors and offices, to keep the brand's identity without missing the ergonomical and practical assets of contemporary office interiors. New Brand in the wellness and spa field in Greece, developed as an innovative company that combines tradition with high technology. 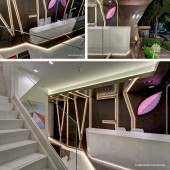 Vivifying Minimalism Corporate Design by Helen Brasinika is a Nominee in Interior Space and Exhibition Design Category. · Click here to register today inorder to be able to view the profile and other works by Helen Brasinika when results are announced. Vivifying Minimalism Corporate Design by Helen Brasinika is Winner in Interior Space and Exhibition Design Category, 2013 - 2014. · Read the interview with designer Helen Brasinika for design Vivifying Minimalism here. · Press Members: Login or Register to request an exclusive interview with Helen Brasinika. · Click here to register inorder to view the profile and other works by Helen Brasinika. Did you like Helen Brasinika's Interior Design? Did you like Vivifying Minimalism Corporate Design? Help us create a global awareness for good interior design worldwide. Show your support for Helen Brasinika, the creator of great interior design by gifting them a nomination ticket so that we could promote more of their great interior designs.